Can't resist a challenge, me! When I heard about the Super Bowl Challenge 2011 on flickr it seemed like a good excuse for an excursion into trinket bowls. I wanted to make something free form and a little rustic, so I didn't make a mold. I just showed my rolling pin to some paper clay and set off on the journey. My final piece is made of thin air drying paper clay. 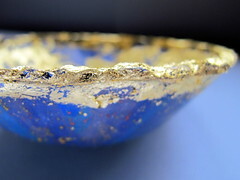 It made a delicate but flimsy bowl, so I painted the underside with a layer of resin in ocean blues and splatters of red and yellow crushed pastels. This is waterproof and has also made the bowl sturdy. The inside is painted with gilding size, powdered blue pigment and then gilded with 22 carat gold leaf. The process has taken a couple of days and I was delighted to find the time to try some new stuff. It's really a bit too bling for me but if I ever get around to making a mold I'd love to make some resin bowls. I like this kind of sporting challenge? How about a Wimbledon Plate Challenge? wonderful, love the gilding. Go Packers!